I have created a font for the sitelen pona hieroglyphs. With linja pona, I wanted to create a standard font that was simple and that could be read easily at different sizes. As you can see, I implemented compound glyphs, a key feature of the hieroglyphs. You can download the font here and use it as you want. It's completely free, you can even modify it if you want. Want to see what can be done with linja pona ? So what do you think ? pona ala pona ? Very nice! Not enough to make me approve of using sitelen pona for any purpose other than decoration, but this is really decorative. Nice job on the missing glyphs, too. jan Same wrote: So what do you think ? pona ala pona ? I liked how you put the "musi" into "kalama musi". The “tu wan” glyph isn't really a compound glyph, it's more like a ligature. Same for “luka luka” and “tu-tu”. They're used for clarification when writing numerals, I wouldn't really use them in a sentence. But as of now, that compound glyph doesn't exist, I only made the well know ones like “tomo-tawa”. If it exists one day, I might change the programing. For now you have to write them separately. Last edited by jan Same on Wed Apr 12, 2017 1:50 am, edited 1 time in total. 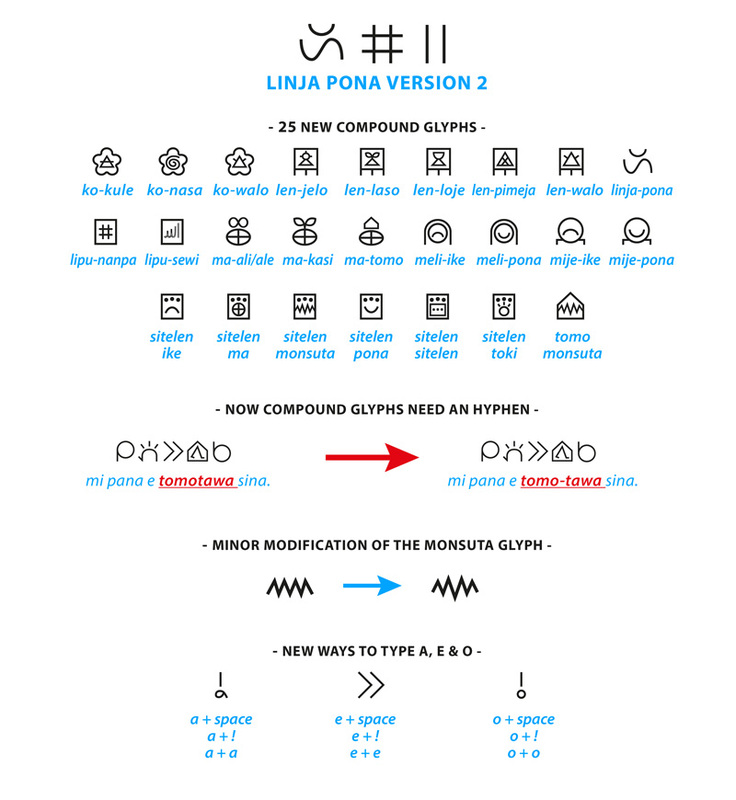 I have updated my linja pona font for sitelen pona, there's lots of new features and modifications. Today I'm releasing the new version of the linja pona font. The new version has 161 new compound glyphs. A few old glyphs were also slightly modified. That made me think of something to suggest - in Jonathan Gabel's sitelen sitelen hieroglyphs, the complex Egyptian-style ones, he has also done a system that can show syllables - useful for names etc. Would it be possible to add something like this to the linja pona font? The official spelling technique with sitelen pona is acronymic, spelling out the word using symbols for words that begin with each letter (inside a cartouche to avoid confusion). This could probably be standardized -- the same word each time a letter is used (this is sorta the history of alphabets, etc.). Moving from that to a syllabary, if that is how you want to go, might take some ingenuity in or in place of a new set of symbols. I don't think all 46 legal syllables (ignoring final /n/ for the moment) are realized in the (say) 130 words actually used (I can't, off the top of my head, think of either a /jo/ or a /ju/). There are several ways to fix that, more or less arbitrarily. The final /n/ can be dealt with a la mode Japonaise with a diacritic, in tp's case, probably some version of the 'ni' symbol. Well, that seems to be for sitelen sitelen: I thought you were developing sitelen pona.